The first time I read Ray Bradbury’s 1957 classic, Dandelion Wine, it was an assignment for school. I was a little older than Doug Spaulding, the novel’s 12-year old protagonist at the time, and to be frank, I didn’t really care for the book at all. That was a crisis for me, as Bradbury was one of the three novelists who I really, really enjoyed (along with Roger Zelazny and C.J. Cherryh). I’d gobbled up Bradbury’s The Martian Chronicles and read every collection of his short stories that I could find. But as a newly minted teenager, I wasn’t interested in reading about tween-aged kid who came from a loving family living in an ancestral home where reasoned discussion was the norm, a kid who exchanged good-natured ribbing with relatives and kind-hearted friends, an outgoing kid who was comfortable with people and who bubbled with excitement about life. Up to that point, my life had included three different homes, four different schools, and several changes to my circle of friends. I’d had a mother who died too early, a sister booted from the house, daily strife with an overwhelmed stepmother, and regular bouts of bullying at school. I did not want to read a book about the kid who I wasn’t and never would be like; rather, I wanted to read a book about the man I wanted to grow up to be. So . . . I didn’t really care for Dandelion Wine. Today, it’s a different story; not Bradbury’s novel, of course, but me, the person reading it. I picked it up last week—OK, I went downstairs, searched through my shelves of “keeper” books, found its slim, battered spine, pulled it out, blew off the accrued dust and cobwebs, cracked open its brittle, yellowed pages—and gave it another read. What a difference forty-five years makes. Everyone who writes or who aspires to write should read a book like this every once in a while. 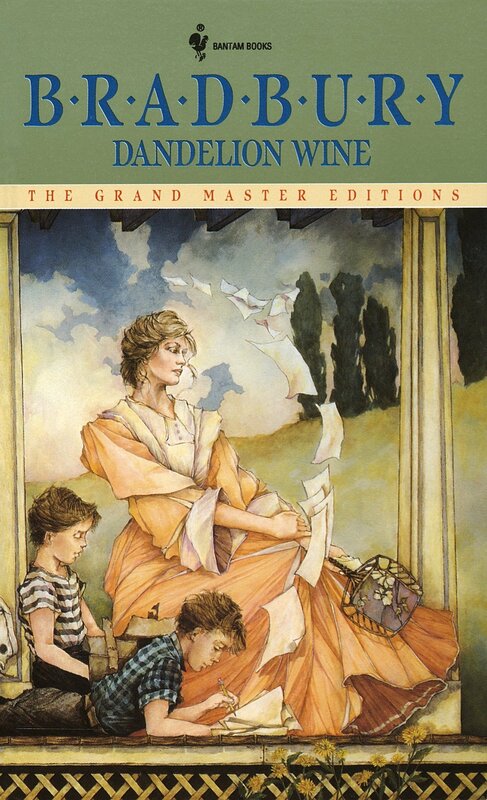 Dandelion Wine isn’t your standard novel. There isn’t a single-threaded plot that leads you from chapter to chapter. Like The Martian Chronicles, it’s a clever post-production edit of previously published short works, all woven together with interstitial segues and new vignettes. It’s less a portrait of a character and more a landscape of a town, a time, a community, so when you read it, don’t expect a tightly wrought plot where every element is crucial to the action. This is not that. Bradbury’s prose is incredibly robust. Everything in the book is described in active terms: colors leap out, scents swirl around, sounds have emotions, and inanimate objects stand by with purpose and intention. Every paragraph, sometimes every sentence, carries sensory descriptions of sound, taste, smell, heat or cold, hardness or pliancy, all on top of the simple visual aspect. Metaphors abound, weaving imagery amidst the images, context within subtext within text. That also is not the caveat. The caveat is this: if you are a writer who aspires to create art as well as tell a good story, you may find Dandelion Wine somewhat depressing. Reading it, I reveled in the magic of Bradbury’s words. I regularly put the book down, leaned back, and savored a particular picture he’d just painted. The book, a freewheeling tour of a small rural town in 1928, drew me in and let me walk the quiet streets, enjoy the long summer nights laced with mosquitoes and sweet tea, chat with eccentrics and dreamers, and revel in the blossom of exuberant youth where the greatest realization of all is the simple fact that we are alive. At the same time, though, there was a part of my mind—the writer-aspirant, the author who has yet to “make it,” the nine-time novelist struggling to write his tenth—that reads Bradbury’s brilliance and can only see how far I have yet to go, how much I have yet to learn. It is that part of my mind that despairs of ever improving sufficiently to achieve even half of what Bradbury has in this book. It’s worth reading, though. Definitely worth reading. Because even if I do fail to cross half the chasm that separates my best writing from Bradbury’s worst, I know where I am going. I have direction. Though I may never reach it, I can see the Promised Land, I can hear the rush of its waters, breath the sigh of its winds, smell the aroma of its bounty. And that, for now, shall be enough.